Hayes’ Chloe Barton, left, tries to evade the tag by Groveport catcher Hannah Cline during Tuesday’s non-league showdown in Delaware. 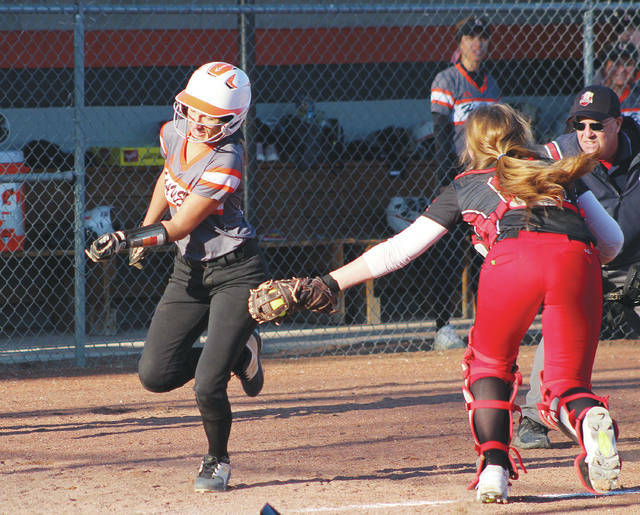 The Delaware Hayes softball team plated four runs in the third to flip an early deficit into a one-run lead, but visiting Groveport took control from there, using a pair of big innings to post a 14-5 non-league win Tuesday in Delaware. The Cruisers scored four of their own in the fifth and, after the Pacers (4-3) got one back in the bottom half, used a seven-run seventh to all but seal the deal. Alex Armstrong and Maiya Cloud each finished 2-for-4 with two RBI for Hayes. Laiha Slayton also had a pair of hits in the setback. Haley Osborne suffered the loss in the circle, allowing 10 runs (seven earned) on 13 hits while striking out one and walking two. Big Walnut 17, Whetstone 2, 5 inn. Hailey Krinn and Molly Sharpe combined for seven hits, two homers, 10 RBI and seven runs scored as the Golden Eagles rolled to their third straight five-inning win of the season Tuesday in Sunbury. Sharpe finished 4-for-4 with a home run, five RBI and four runs scored while Krinn was 3-for-4 with a homer, five RBI and three runs. Alyssa Tarney, Jojo Lucas and Karley Becker also had multi-hit games for Big Walnut (3-0). Sierra Perry picked up the win in the circle, allowing two runs on four hits while striking out three and walking six. The Barons broke the scoring seal with a two-run third, but the Colts answered with four in the fourth to take the lead on the way to an MOAC win Tuesday in Delaware. Ashlea Kehl, Lilly Irvine and Nina Peak had two hits apiece for BV. Peak knocked in a pair of runs and Irvine drove in the other. Irvine took the loss in the circle, allowing eight runs (seven earned) on 11 hits while striking out seven and walking two. Delaware Christian 17, Granville Christian 7, 6 inn. Claire Bowman and Katie Neuhart had three hits apiece to lead the host Eagles to a lopsided league win Tuesday in Delaware. Bowman complemented her hits with three RBI and three runs scored while Neuhart had two RBI and four runs. Pickerington Central 18, Olentangy 8, 6 inn. Payton Cox had two hits and three RBI and Brooke Wells added a two-run homer, but it wasn’t nearly enough for the Braves to keep pace with the host Tigers Tuesday in non-league play. Pickerington Central scored seven times in the first inning to take control. Olentangy picked up a convincing non-league win Tuesday in Sunbury, sweeping away host Big Walnut 5-0. The Braves were boosted by Sam Routzahn (6-0, 6-1 win at first singles), Omar Khayat (6-1, 6-0 win at second singles) and Ayush Sunkad (6-0, 6-0 win at third singles). Doubles winners included Tucker Strawser and Roshan Sriram (6-3, 6-1 at first doubles) and Jayanth Donthireddy and Trevor Gerald (6-0, 6-2 at second doubles). The Pacers picked up a solid league win Tuesday, securing wins on all three singles courts to outlast the Panthers. Hayes winners included Kyle Klumpp (6-0, 6-0 at first singles), Sam Bonofiglio (6-1, 6-0 at second singles) and Ryder Kardas (3-6, 6-4, 6-2 at third singles). Buckeye Valley started fast and never slowed down, rolling to a 16-6 win over visiting Johnstown Tuesday in Delaware. The Barons, who got six goals from Zach Garber and five more from Reid Lajeunesse, led 6-1 after the first quarter and 10-4 at halftime. Andy Nero and Carson Artrip had two goals apiece and Cole Davis added the other. Connor Brant anchored the defense with five saves in the BV goal. Tyson Chapman had three goals and Joey Wiseman added two more to help the Patriots double up the Pacers Tuesday in Powell. Andrew Lyon led Hayes with a pair of goals in the setback. Khairi Sears and Evan Parrott had four goals apiece to lead the Braves past the Bears Tuesday night. Austin English got in on the act, too, finishing with three goals in the win.